This is one of the 276 Devara Paadal Petra Shiva Sthalams and 8th Shiva Sthalam in Nadu Naadu. Lord Shiva in this temple is a Swayambumurthi (self-manifested) who is believed to have appeared in the midst of Jambu trees (Naaval). This is the birth place of Saint Sundaramurthy Nayanar, one of the four great Saints (Nalvar) and one of the 63 Nayanmars. This temple’s entrance has a 5- tiered main tower (Rajagopuram) and it has 2 corridors. Thirunavalur is situated in the erstwhile Thirumunaippadi Nadu and is in between the rivers Gadilam and Pennai. The temple is considered to be one of the oldest one and is said to have existed here even before the 4 yugas. This temple was earlier called “Thiruthondeecharam” and the place around it was called Thirunavalur and Jambunathapuri. It is said that Goddess Parvathi, Lord Brahma, Lord Mahavishnu, Chandikeswarar, Sukran, Indran, Ashtathik Balakars, Suryan, Saptharishis and Garudan have worshipped Lord Shiva in this temple. 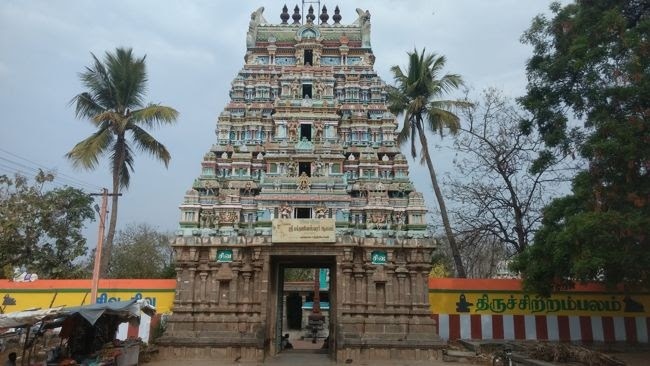 Also, Saint Sundaramurthy Nayanar, and his parents Sadaya Nayanar and Isaignaniyar and his foster father Narasinga Munaiyaraiyar have worshipped Lord Shiva in this temple. All of them find a place among the 63 Nayanmars. As advised by Goddess Parvathi, Sukrachariyar (Sukran) worshipped the Lord Shiva here and got relieved from “Vakra dhosham”. The lingam installed and worshiped by Sukran is named as “Bhargaveeswarar” and it can be seen in the temple’s corridors. Lord Mahavishnu is believed to have worshipped Lord Shiva here to seek his blessings before taking the “Narasimha Avatar” to destroy demon Hiranyan (Pragalad’s father). There is a separate shrine for Sri Varadaraja Perumal (Lord Mahavishnu) in this temple. Goddess Parvathi is in a separate temple and can be seen in a meditative posture. It is interesting to see that her hair is not braided or tied. The temples of both Lord Shiva and Goddess Parvathi are facing east. Shrines and idols of Lord Vinayakar and Lord Murugan with his consorts can be seen in the corridors. In this temple, Lord Dakshinamurthy is seen in a standing posture with his bull mount but without Muyalagan under his feet. Lingams worshiped by Saptha Rishikals, Pollapillayar, Sekkizhar, Gajalakshmi, Navagraham, Sri Bhargaveeswarar, Suryan and Bairavar can be seen in the corridors. In the corridors, there are Shiva lingams that are believed to have been worshipped by Lord Mahavishnu in Kirutha yugam, Chandikeswarar in Thretha yugam, Lord Brahma in Dwabara yugam, and Saint Sundarar in Kali yugam. The beautiful procession idols made of bronze (Utsava Murthy) of Lord Natarajar with Sivakami Amman, Vinayakar, Murugan, Bhikshandavar, Saint Sundaramurthy Nayanar with his two wives and the Nalvar can be seen in the temple’s hall. 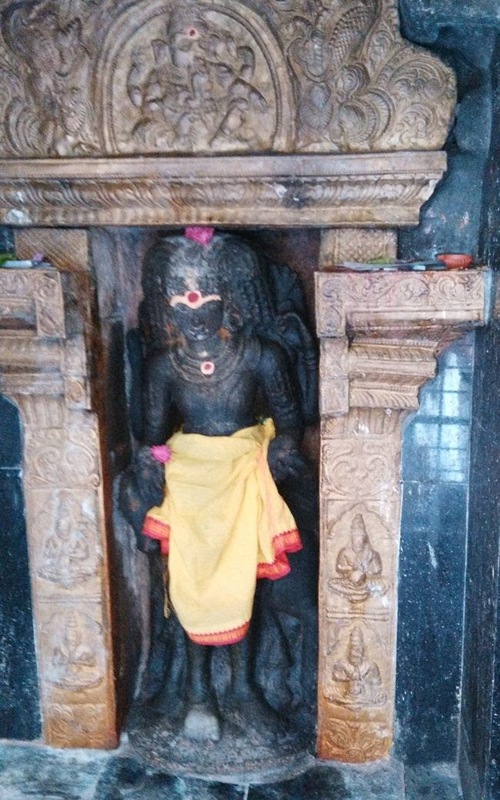 There is a Shivalingam in the inner corridor that is believed to have been worshiped by King Narasinga Munaiyaraiyar, foster father of Saint Sundamurthy Nayanar. 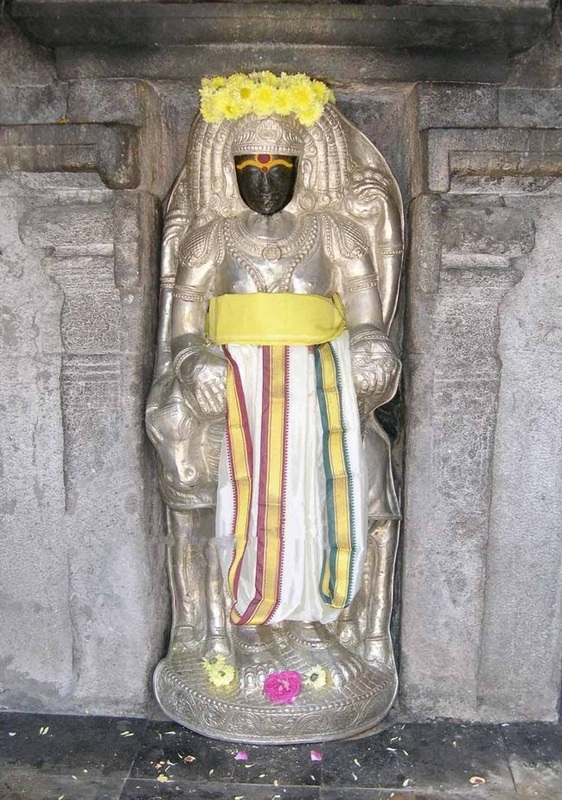 Lord Dakshinamurthy’s idol here is in a standing posture with his bull (Rishabha Vahan) and is believed to have given darshan to Saint Sundarar. It is believed that worshiping Lord Dakshinamurthy here is especially auspicious for those born during the time of the “Poorada nakshatram”. This is the birth place of Saint Sundaramurthy Nayanar, who is also known affectionately as “Thampiran Thozhan” (Lord Shiva’s comrade). He was an eighth-century poet who was one of the most prominent Nayanmars. The hymns (Pathigams) rendered by him are called “Thiruppattu”. A separate shrine for Saint Sundaramurthy Nayanar with his wives Sangili Nachiyar and Paravai Nachiyar can be seen in the temple. Thirunavalur is situated at a distance of about 28 kms from Villupuram. On the Villupuram to Trichy National Highway (bypass), at the Gadilam junction, there is an over bridge. Take the service road under this bridge to get on to the Panruti road. Continue on this road further for about 3 kms to reach this temple. The temple is 12 kms from Panruti on the Panruti to Ulundoorpettai road and it is 15 kms from Ulundoorpettai.